The number of houses being flipped is generally a pretty good indicator of how much speculation there is in a housing market. When prices are rising there’s plenty of liquidity and it seems there’s always another buyer willing to pay a higher price. Flipping a house becomes perceived as risk free. Currently we are seeing strong evidence of this in the Vancouver real estate market. I ran the numbers back in June 2017, but here are the updated numbers. For simplicity I have quantified a flip as a home that has been bought and re sold within 24 months. 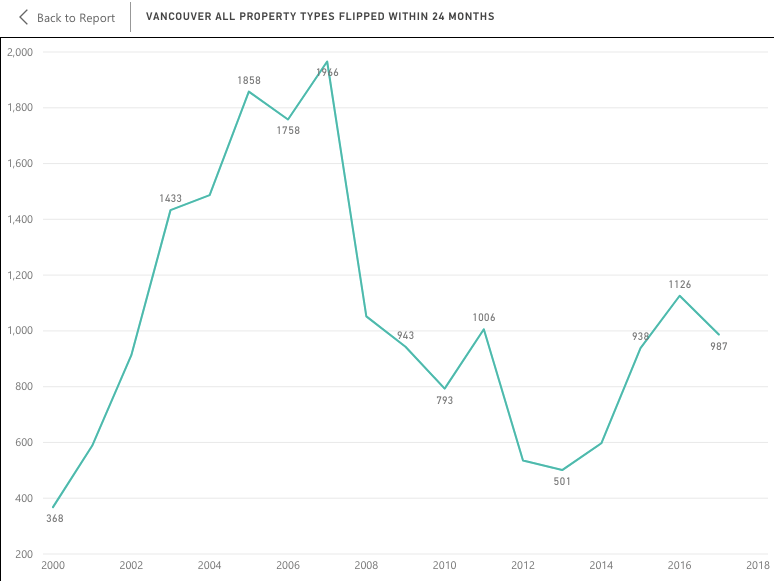 With just a few weeks left in the year, there have been 685 Vancouver condos flipped this year. That’s a staggering 74% increase from the year previous. Vancouver condos bought and sold within 24 months. 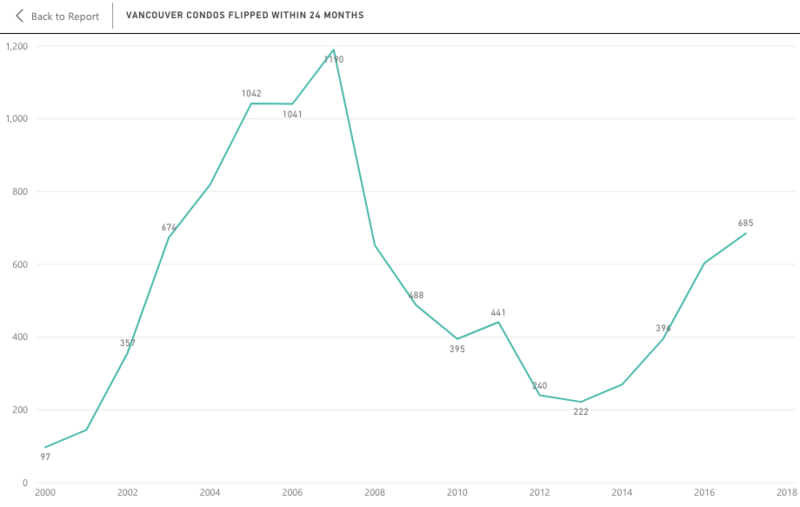 The 685 condos flipped is equivalent to 10.9% of all Vancouver condo sales this year, a nine year high. So yeah, basically one in every 10 sales this year were owners who were cashing in huge profits. Vancouver detached prices are softening. Sellers are slashing prices, and buyer FOMO is non existent. With that, house flipping has died. Midway through December there have only been 201 houses flipped, a 17 year low. You’ll notice that peak flipping activity was set back in 2015 for this latest housing boom. Vancouver Detached Houses bought and sold within 24 months. A friendly reminder that real estate is cyclical. Despite recent belief, house prices don’t go up in a vertical line forever. Further, speculation, foreign buyers, and euphoria are part of every housing boom. 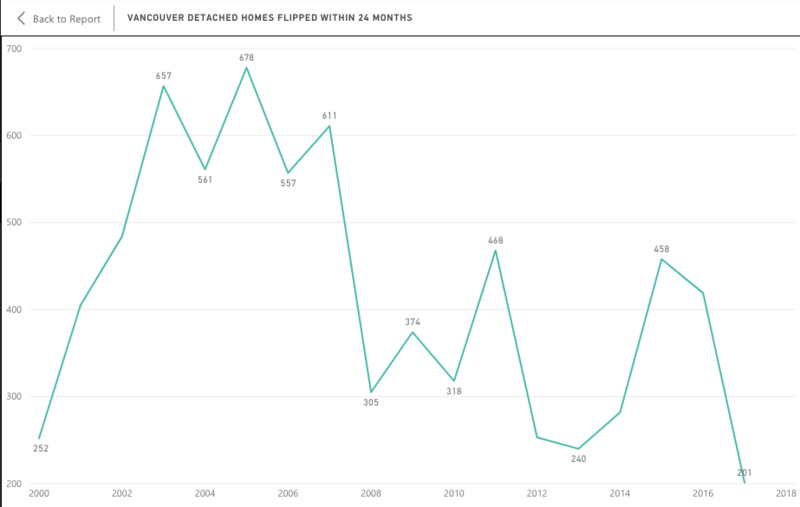 As you’ll see, record house flipping activity in the Vancouver Real Estate market actually occurred back in 2007. Prices rise and fall, and house flipping follows that trend. 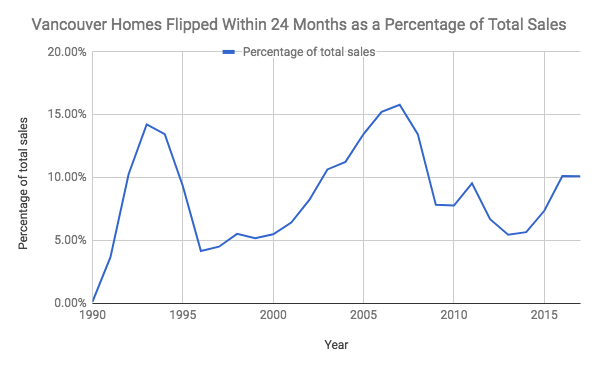 House flipping spiked in 1993 at 14% of total sales before plunging to a low of 4% in 1996. House flipping spiked again in 2007 at 15.8% of total sales before falling again to 5.5% in 2013. More recently house flipping surged once again to 10.1% in 2016 and appears to be on it’s way back down. 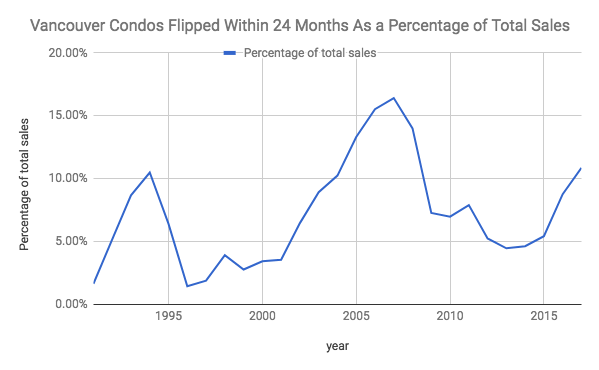 All Vancouver homes flipped as a percentage of total sales.